Reviews and News about British, European and Translated crime fiction, tv and film. The book begins with a short prologue, describing an event forty-five years ago in which two women, one Jewish and one Arabian in hospital, have both just given birth to a child; the Arabian to a girl, her seventh, and the Jewish woman to a boy. This sets the scene for the big ‘lie’ that follows on later in the book, but the whole story is about lies and subterfuge. First, Edward Al-Masri, a professor at McGill University and famous author, is about to travel back to Israel, where he was born and lived as an Arab in Israel for many years. He is taking with him a suitcase packed with money in a hidden compartment. This is deliberate act, with inevitable consequences when this is discovered on his arrival. Second, Dahlia Barr, forty-four-years-old and a well-known human rights lawyer is summoned to see the head of Israeli security, Zarman Arrad. He wants her to work for him, to assess suspects and decide when stronger means of interrogation might be allowable. She is married (but about to be divorced) with two sons, one of whom, Ari, is currently doing his national service in the paratroops. And then disaster strikes. Terrorists kidnap Ari on the border of Israel and Lebanon, and hold him hostage. Somehow there are connections between Edward and Dahlia, which feed into the developing story, and Edward becomes key to the release of Ari. 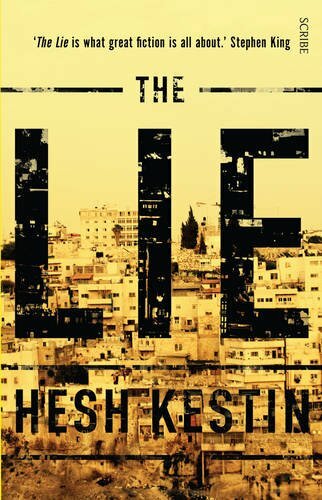 THE LIE is an enjoyable short book, which has real insight into the issues of Arabs and Jews in Israel and surrounding countries, their behaviour towards each other, and the inevitable consequences of their actions. The first part of the book was particularly strong, with characters well described and a real feel for the local culture. The latter part of the book was slightly less believable, as the real consequences of the big lie start to unfold. But overall I liked this book a great deal and recommend it. Share book reviews and ratings with Eurocrime, and even join a book club on Goodreads. Library Assistant, Cat Owner, Doctor Who, Star Trek and Crime Fiction fan.